Michelle and I collected a five gallon bucket full of pecans from the ground beneath one of her parent’s trees. As we worked, we talked about what we were going to do with them. Top of the list was to make a Black Bottom Bourbon Pecan Pie (here is our recipe). 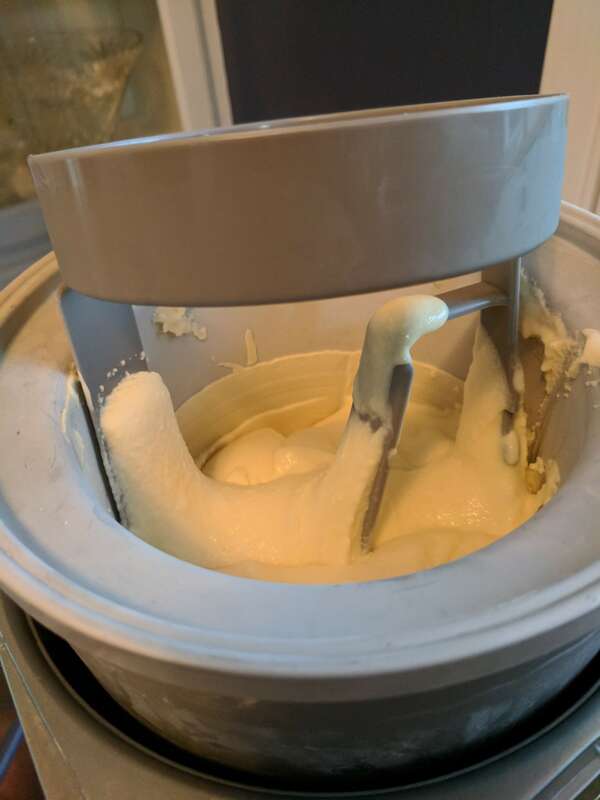 As I’m a firm believer that you can’t have pie without ice cream, I thought we should keep with the tipsy theme so we fixed a batch of bourbon vanilla. For extra umph, if you have a vanilla pod, slice it in half and scrape out the seeds. Add pod and seeds to the cream and milk and sugar as it heats. Once you’ve added the eggs and cooked the custard through, remove the pod before cooling the custard. In a medium saucepan, mix cream with the milk, sugar, and a pinch of salt. Warm the cream mixture over medium-high heat, stirring occasionally, until the sugar dissolves and tiny bubbles begin to form around the edge of the pan, about 5 minutes. Whisk the egg yolks in a medium bowl. Pour a portion of the warm cream mixture into the egg yolks and whisk to temper the eggs. Then pour the egg mixture back into the saucepan and cook over low heat, stirring constantly and scraping the bottom with a heatproof rubber spatula until the custard thickens slightly (it should be thick enough to coat the spatula and hold a line drawn through it with a finger), about 10 minutes. Don’t let the sauce overheat or boil, or it will curdle. Remove from heat. Stir the bourbon and vanilla extract into the custard. Cover the custard with plastic wrap and refrigerate until completely chilled, at least 4 hours. Freeze the custard in your ice cream maker according to the manufacturer’s instructions. Transfer the churned ice cream to an air-tight container and freeze for at least 4 hours or up to 2 weeks.